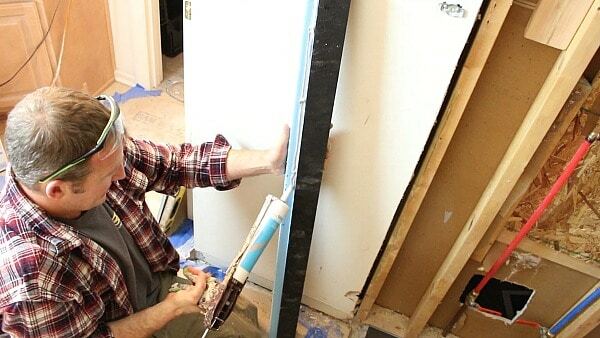 …and it just might inspire you to remodel your bathroom!! 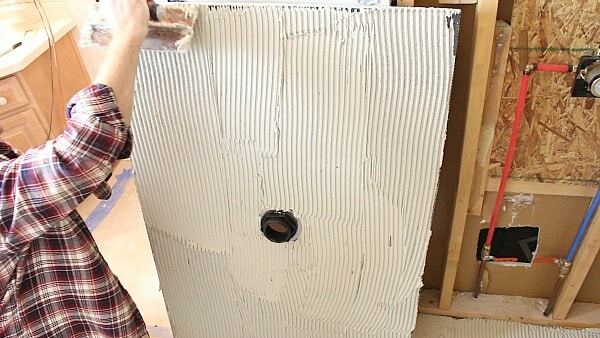 Our prior tutorial showed how to cut the wedi Fundo Primo shower pan to size. 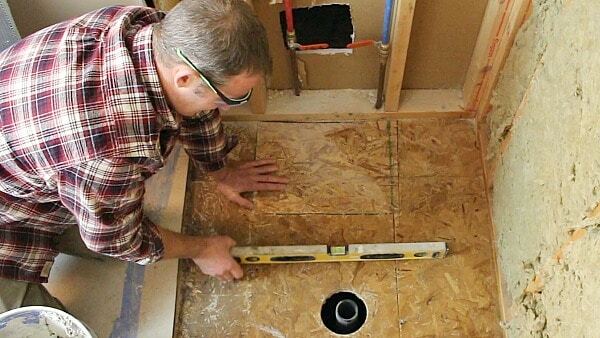 Today you’ll see how to install the Fundo Primo shower pan and curb. Wedi shower systems are very easy to assemble. We installed the Wedi Fundo Primo shower kit in this bathroom because it was a tub to shower conversion. And we were limited on time – only had a few weeks to get it done! Keep in mind, this is part of a video series. The rest of the videos are available both on YouTube and here on Home Repair Tutor. 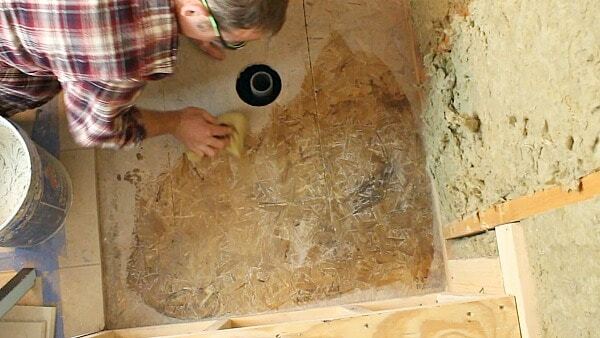 First, check the shower subfloor with a level. In this example our shower floor sloped a bit. We address how to fix this problem later. Then set the drain in the floor. We recommend letting the drain pipe run a bit wild, i.e. a few inches above the subfloor. 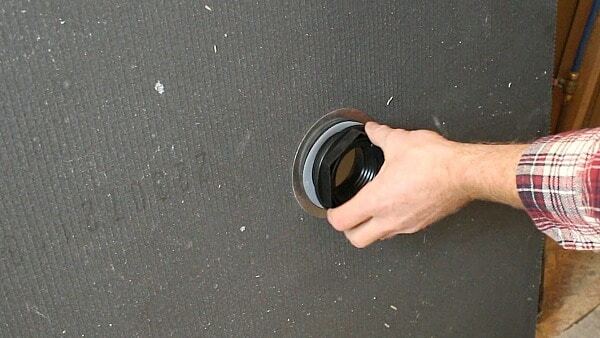 The drain pipe should be set by a professional or plumber if you don’t feel comfortable doing it yourself. It needs to be cut down and 1/8″ above the subfloor. Drain installation for the Fundo Primo is critical. So it’s super important to get right! 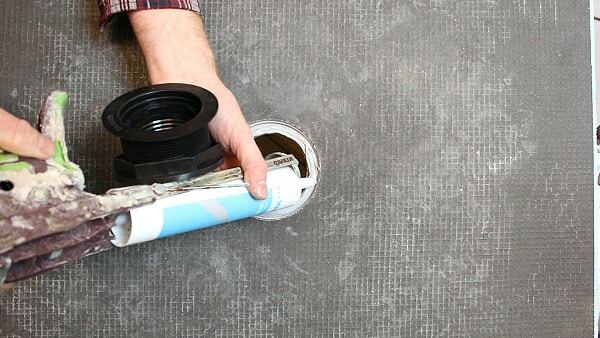 Apply a generous bead of Wedi Joint Sealant in the drain recess. Compress the drain into the joint sealant and add the rubber gasket, plastic slip ring, and nut. And hand tighten the nut on the back side of the pan. There’s no need to use a wrench with the nut. Smooth any residual joint sealant that oozed between the drain and top of the Fundo Primo. Steve does a great job showing this installation in the video. Mapei’s Kerabond T (unmodified) was used for this project. We added Keralastic to make it a modified thin-set. Mix modified thin-set according to the manufacturer’s directions. It’s a lot easier to use a mixer for this. 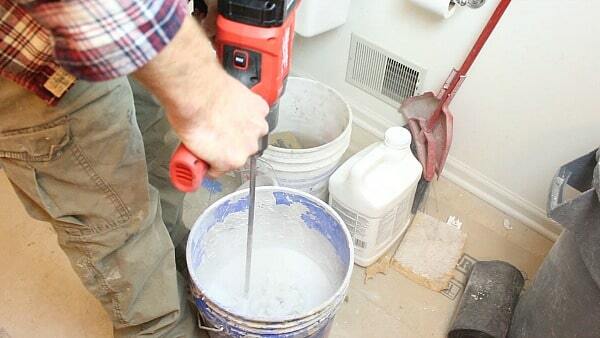 We really like Milwaukee’s cordless mud mixer. It’s surprisingly powerful and does a great job. Clean the subfloor with a damp sponge. 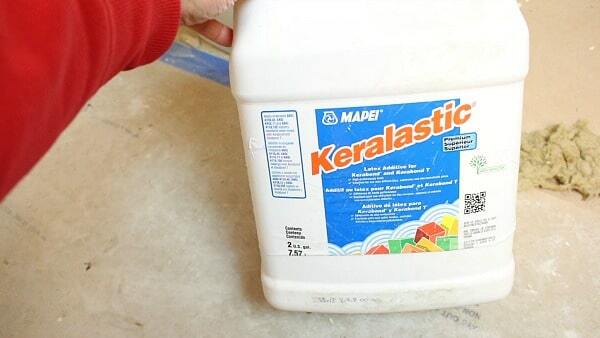 This prevents wood subfloors from absorbing the thin-set’s moisture. 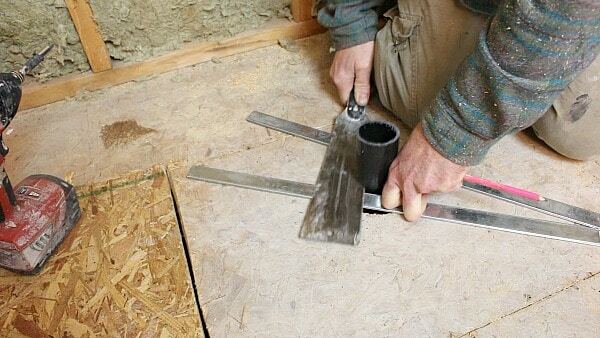 Burn the thin-set onto the wood subfloor using the flat side of a 1/4″ x 1/4″ square notched trowel. Then use the notched side to trowel more thin-set onto the subfloor. Directional troweling is recommended, i.e. trowel notches face the same direction. 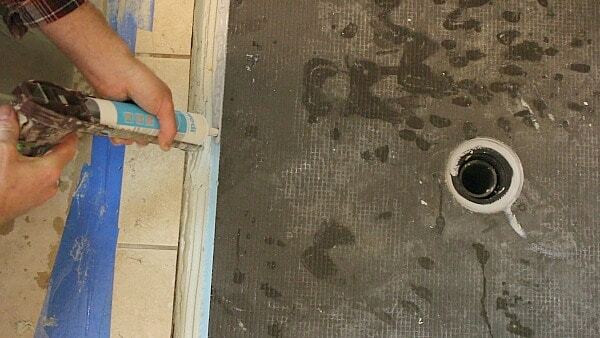 We applied a thicker layer of thin-set on the sloped side of the shower subfloor to correct it. Back butter the Wedi Fundo Primo shower pan with the flat side of the trowel and Kerabond/Keralastic. Also, use directional troweling with the notch side of the trowel on the back of the Fundo Primo shower pan. The notches on the back of the shower pan should be in the same direction as the notches on the subfloor. 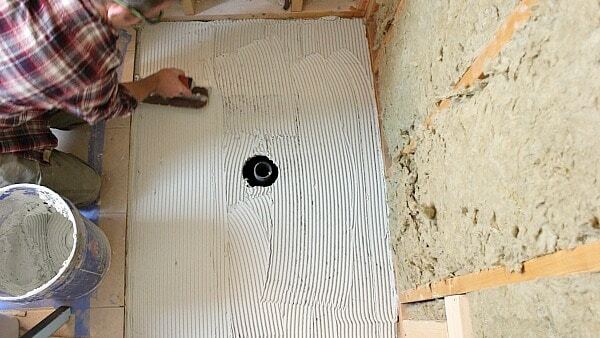 Embed the Wedi Fundo Primo into the thin-set on the subfloor and compress the trowel notches by walking on the pan. Check that the pan is level. Then apply a copious amount of Wedi Joint Sealant on the pan’s rabbet joint – both on the top and on the side. Add Wedi Joint Sealant to the curb’s rabbet and apply thin-set to the bottom of the curb. Embed the curb into the shower pan’s rabbet and compress the Joint Sealant. Then check the Wedi Lean curb for level. Finally, add the rubber gasket and pipe connection. The wedi rubber gasket has a beveled edge and it should face up. Also, the rubber gasket should be flush with the top of the pipe or a bit sub-flush. 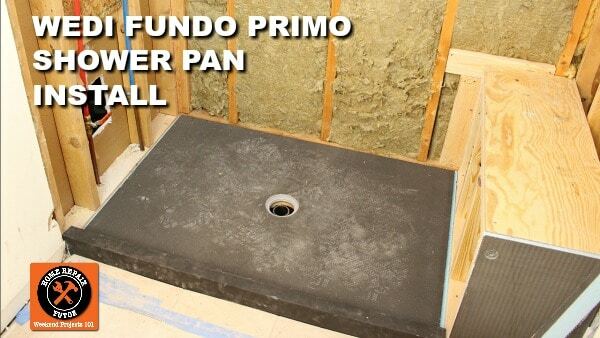 Watch our video for all the details on how to install the Wedi Fundo Primo shower pan! Our prior tutorial shares how to cut the Wedi Fundo Primo shower pan to size. Just wondering if you offer advice on building a new shower. We want to put a shower and toilet in our laundry room for guests. Thanks Jaime, you bet. We’d be happy to help. What kind of shower are you building? Good question Glenn. The nice thing about Wedi backer boards is they can accommodate any dimension. And we’d be happy to help you figure out how many boards you need for your project. Send me an email ([email protected]) and let me know what kind of shower you’re building. Then we can put together a roadmap for your remodel. We do this a lot for homeowners or contractors using Wedi or KBRS. Just like in your video, my shower is about 1/2″ out of level along the back wall. It’s too low. I want to level only the area under the 3×5 wedi shower base. The subfloor is plywood with Adventech patches. The floor joists run parallel to the 5 foot dimension of the shower. In the video, only thin set was used to raise and level the shower. Since mine is a little more out of level, do you have any suggestions on what to use to level (raise) the shower base? The floor is already closed with a pony wall installed (it’s level). I need to level from 0″ to 1/2″ over 32″ (two joist bays). I was considering using Henry 555 LevelPro but wondering if there’s something better for this purpose. 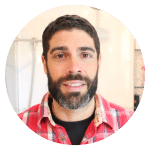 Jeff – when using the Fundo primo pans and the lean curb, when I set the curb rabbet joint into the pan, the curb sits about 1/2” off the floor. Do you field cut the height of the rabbit joint as well? Or build up the diff w 1/2” Wedi or another substrate? My fear w deepening the curb joint to sit flush is cutting it close to the curb being 2” above the drain per IRC… Thoughts? It’s best to get the curb rabbet to sit as flush as possible to the pan joint, that will ensure the polyurethane bonds properly. If that means cutting down the curb slightly to get a tight joint then you should be okay. Feel free to send some pictures and we can take a look.